Capstone Project: MA in Art Education, University of Florida, 2013. The Mount Olive Recreation Department (MORD) in New Jersey has earned the trust and appreciation of members of the community and neighborhood townships over the years. This recreation department has developed several enrichment programs, including foreign languages, science, music, sports, and crafts for all ages. In addition, MORD offers several annual activities such as tournaments, walks, fairs, and even a successful summer carnival that gathers over 10,000 people around town. Unfortunately, art programs at MORD generally do not have the same registration rates as other activities and enrichment programs. This fact captures my attention particularly, because I perceive there is interest in art and creativity among the population. For instance, and fortunately for me and my students, the discipline-based art education (DBAE) program I facilitate Play, Paint and Create has endured for more than five years, offering children in the area an artistic and creative space to be after-school. The purpose in this research was first to identify the reasons why there seems to be so little community interest in art programs previously offered through MORD and search for what kinds of programs might interest people in the future. Then, collected opinions about and ideas for possible community art programming from other art educators in Mount Olive. Furthermore, connected public entities and open spaces to work together nurturing an artistic community by sharing views and created opportunities for collaborative and community-base art projects. Finally, developed a framework of ideas for community-based programming that fosters the artistic community of Mount Olive. As an art educator, I value the significance of art in the development of individuals and communities. I can see the positive impact that artistic activities may have for promising artists. As Beth Krensky and Seana L, Steffen stated in the book Engaging Classrooms and Communities Through Art, “art has the power to touch imagination, evoke possibilities and alter life”(2009). The key is communication: Jarvis Ulbricht stated, “If art teachers and students can clarify their community-based art education definitions and objectives, then they can envision meaningful projects and programs that are enriching and educational” (2005, p. 11). Art helps people shape their ideas and feelings so that they can become better participants in their societies. I am pleased to have the chance to develop artistic opportunities in my community. Are people in Mt. Olive interested in more community-based art opportunities and if so, what kind of programs? What role might schools and public entities play in collaborative and community-based art projects in Mt. Olive? In order to implement collaborative artistic opportunities in Mount Olive this research focused on (a) learning about community needs and history of past artistic programs, (b) conducting a survey during the Mount Olive Community Summer Carnival to selected parents and other adults interested in artistic activities for themselves or their children, and (c) brainstorming with other art educators from the district to gather ideas for possible community-based art activities. The result, the Capstone project, was organized in three parts and displayed at the Mount Olive Public Library through the month of November. The first part was an informative wall with two info-graphics I designed. 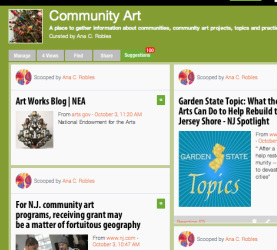 Info-graphic A was about community-based art and the benefits of art for the individual and for the community, and the most important artistic towns in New Jersey. Info-graphic B, focused in collaborative art and Mount Olive experience with these kinds of projects. The second part of the project was a display of a collaborative art piece created at the first Mount Olive Community Art Show last summer, made out of one hundred and twenty-four popsicle sticks. Each stick was designed by different individuals, children and adults, and was placed together forming a big colorful piece of art of 24” x 24”. Finally, the last part of this project consisted of a collaborative art project where community members could participate during the display at the library. This particular piece has a significant importance to me, and I hoped, to many people in Mount Olive. It consisted of more than one hundred branches, collected when storm Sandy hit our community a year ago, put together to represent our strength. Participants had the chance to decorate their own branch with different color rubber bands and place them in a structure made out of intrinsic natural elements and wire. Next to the collaborative art piece was a notebook where people could leave their memories about their Sandy experiences, a thank you note, or just their thoughts on the project. Community-based art is defined broadly as the artistic activities that take place outside of schools, in places such as park facilities, art centers, art museums, public libraries, retirement centers, storefront galleries & businesses. Artistic activities contribute significantly to the maintenance of neighborhood spirit and traditions that are integral to the growth of a community. Community-based art activities empower members of the community to enhance their lives and raise awareness about the social, political, and economic issues that impact a community’s quality of life. What is a Collaborative Artwork? Collaborative Artwork is when individuals work together, combining their artistic ideas, strength and creativity to accomplish an expression of art for the benefit of the community. “Children learn to become competent when they paint. They learn skills that expand their power, and with that power they can say more to both, to themselves and to the world”. Provides an intrinsic form of satisfaction and accomplishment. Helps in the development of language and motor skills. Teaches accountability, collaboration and community. Shows that actions have consequences, judgments and feedbacks. Learn to stand up for one’s own ideas. Increases participatory multicultural practice and communication. It is a symbol of prosperity. Arts add to and supports local commerce. Builds the 21st century workforce. Leadership. Based on the interview to Jill Daggon, Supervisor at the MORD, there is a need of leadership for the arts in Mount Olive. It is not enough to have public agencies interested in revitalizing the arts in the area if there is not a committed individual, or group, with community-based art endeavors. The challenge would be to find passionate people who would like to commit their time to the town and create, little by little, more community-based artistic projects. By creating small collaborative art projects––such as the one I put at the library––people with the same interest will get to know each other and might foster communication, engagement, and finally support each other in the mission. Information. Although people from Mount Olive demonstrated, through the survey, interest in developing artistic skills and community-based art projects, the hustle and bustle of today’s life, plus the many options children have in other afterschool activities, do not let parents focus in the value of art for the development of a child. In addition, the little attention that the visual arts receive from the public schools does not benefit the development of a community-based art program today. In order to generate more artistic interests and opportunities for future generations, a detailed campaign to value art according to the community needs is basic to change things overtime. Participatory Interest. A positive finding through this research was the willingness and interest from public agencies, as the MORD and the Mount Olive Public library, to incorporate more collaborative and community-based art projects. The response and participation of children and adults on my art piece displayed at the library was an example of the interest of the community in trying fresh and new perspectives of art. Future art activities in Mount Olive might increase the community interest in artistic programming along with the support of these two appreciate entities in the area. but about giving and the joy that comes with sharing. Capstone Committee Members Judi Kushins and Craig Roland, University of Florida Professors and Staff. My family, for their support inspiration, patience and love.